Hello dear blog readers! Anyone else counting down to the weekend? I know I am. The weekends around here call for lounging on the sofa and getting DIY projects accomplished. Earlier this month, Daniel and I tackled the final major project in our guest room. You may remember that last month we installed a closet system that we are still smitten with, and we finally finished the closet doors. When we bought the house we inherited the ugly, dark wood hollow core bi-fold doors in the guest room and my office. They’ve sat in the garage for about three years, and now they’re finally back where they belong. I’ll walk you step-by-step through the process below. It may seem like there’s a lot of steps, but I promise it’s not as daunting as it seems. For us, we had most of the supplies on-hand and only ended up spending about $40 out of pocket for new hinges and the moldings. The paint is the same color as the paint we used on the walls of the guest room. I purposely wanted it to blend together to look almost like a built-in piece. Off to True Value we went for some supplies, and here’s what you’ll need to get started. Step 1: Take off the hinges and hardware from your bi-fold doors. Since we were replacing all the hinges because they were rusty/bent, we tossed those in the trash. We did reuse the actual hardware that attaches the doors to the rail on the top/bottom. I’d suggest putting any pieces you’re reusing in a sandwich bag for safe keeping. Using painter’s tape, mark the front/back side of each door as well as its placement so you don’t confuse yourself when it comes time to adhere the moldings. We used L1, L2, R1 and R2. Step 2: Using your medium grit sanding block, sand the front/back sides and edges of all your doors. Sand with the grain. It may be tempting to skip this step, but don’t! You want your primer to really have something to grip to. Once you’re done sanding, use your tack cloth to remove all the dust. We spent about 15 minutes sanding total. Step 3: Apply primer to all your doors using a roller. Allow the primer to dry. Step 4: While your primer is drying, make the cuts for your moldings. Our doors are 14.75” wide by 79” tall. I knew I wanted 2” of space on all sides of the moldings, so I subtracted 4” from my main measurements to make my cuts on the miter saw. 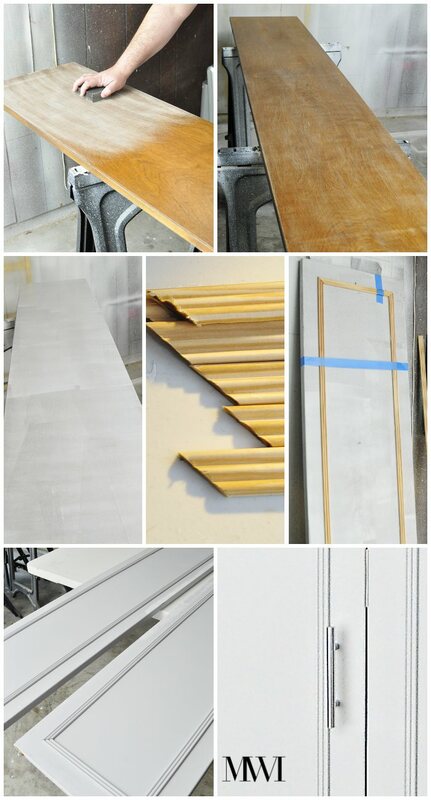 Make sure you set up your cutting station away from your painting station to avoid getting sawdust in your finish. Remember to measure twice and cut once. Once you’re done, cut a spare trim piece to 2” to serve as your spacing guide for adhering the moldings. If your top trim piece goes on level, centered and spaced correctly, your other three pieces will fall into place. Step 5: Once you have all your cuts made, it’s time to adhere the moldings to the door. To avoid having a bunch of nail holes, we used Liquid Nails and it couldn’t have worked out any better. That stuff is really strong! If you use beefier molding than we did, I’d recommend using a nail gun. We applied a thin layer to the entire backside of each piece of molding and to keep it in place to dry we used painter’s tape. Let the glue dry at least 24 hours before moving on to the next step. Step 6: Once your moldings are dry and in place, remove the painter’s tape and caulk all the edges/seams/corners. After the caulk is dry, lightly sand the corners and any other rough spots. Use your tack cloth to clean up any dust. Step 7: Paint your doors and moldings (we used a roller for the edges/center of the panels and the brush for the moldings). We did two coats on the back sides/edges and three on the front side. In between coats, use a fine grit sanding block to get an extra smooth finish, followed by the tack cloth to remove dust. We waited about one hour between coats because I am impatient. Let your doors cure about 24 hours before proceeding (trust me on this…don’t ask me how I know! I had to redo half the doors because I moved them too soon and messed up the paint). Step 7B: OPTIONAL- if you’re using new hinges that need to be spray painted, now would be a good time to spray paint them. The hinges we bought were brass, so I spray painted them silver (two light coats). At this point, we also used our cabinet hardware installation template to add an extra hole to accommodate using a 3” cabinet pull instead of a knob. Step 8: Attach your new hinges and reinstall your bi-fold doors. We found it easiest to get the pin in, followed by the wheel, and then making adjustments for height on the bottom screw. Then we were done and spent an uncomfortable amount of time admiring our handy work. The doors close and open with ease. We kept the existing track in place to avoid problems. It was in great shape. I love how the doors open to reveal that beautiful closet inside. If it’s wrong to love a closet this much, I don’t want to be right. The chair makes it a great spot for guests to sit in and take off their shoes. Overall, I am thrilled with how these closet doors look and function. I just need a few more projects to get done to finally be done with this room. I hope our guests love it! The chrome pulls really polish off the look and make it stand out. The closet reminds me of some of my favorite hotels. 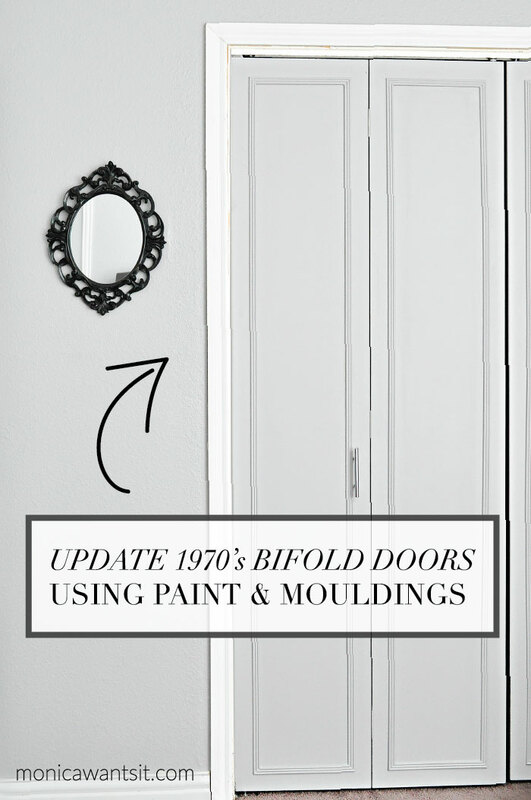 I hope this tutorial has inspired you to make those dated bi-fold doors work in your favor with a little bit of elbow grease and paint. You can pick up supplies at your local True Value where they have great prices and service. I love supporting small town, locally owned businesses. You can also follow True Value on Facebook, Twitter, Pinterest and Instagram for more great DIY ideas. If you have any questions or are confused by any of the steps, let me know and I will help. Thanks for stopping by, and remember to pin this post for later. xo! Hi I am also curious about what the gray paint is on your wall! hi, what color gray paint did you use? Love those doors! I have the same ugly bi-folds and would love to do this. How did you determine the spacing for the molding? These look fabulous. I love the molding, so pretty and chic now.